What kid doesn't like making Halloween crafts? Today the triplets and I made chocolate covered pretzels using fun Wilton candy molds. And we made these fun gouly cupcakes with the googly eyes. We got the idea from my Martha Stewart cupcake book that I got for my birthday. While on our tour in Egypt, our individual travel was limited and I wasn't able to go off on my own looking for a quilt show, if one even existed. I kept my eye open for Egyptian cotton or fabric stores or quilty things along our travels. I saw none. At the tourist markets, the vendors would be sure to tell you they had 100% Egyptian cotton things and really sell you on that. What they don't seem to understand is that we tourists know the difference between good cotton and cheap cotton. The T-shirts while made of 100% Egyptian cotton, were only $2.00 You can just imagine the quality. Just the same I bought 2 Egyptian cotton T-shirts. I also bought some white cotton shirts with fancy embroidery on them. I know they were not good cotton either because of the price. I also didn't even see any sign of cotton being grown as we sailed down the Nile. I'm sad to say that I left Egypt without knowing the Egyptian cotton story. I will find out sometime though. But, our stay in beautiful Aswan treated us to a beautiful stone sculpture display. Much like our ice sculptures, Egypt hosts an annual stone carving contest and exhibition. And guess what I found? Yes , a quilt. A stone sculpture quilt. There wasn't any English explanations of the sculpture, but it gave me my little quilt fix. Here are a few photos of some of the other sculptures. While in Egypt, we went on 20+ tours. We saw it all. We even spent a couple of days at a resort on the Red Sea, just relaxing. By this time, I'm getting really good at speaking Aribic. I know a dozen words/phrases, thanks to our Egyptologist Hesham. I was approached by a young lady vendor trying to sell me a scarf. I politely said La, Shockrun which stands for no thank-you. She stopped right up and looked at me intently, and then she said in a very heavy Arabic accent, "Good Arabic". I was pleased that she had taken the moment to comment on my effort. So, on Friday we started our trek home on Egypt Airlines. We landed in London where we spent the night at a nearby hotel at Heathrow. Early Saturday morning, we caught Air Canada to Toronto, then caught a connecting flight to Fredericton. Yesterday afternoon, we arrived home to be greeted with heavy rain. Now any other time, rain would put a downer on our arrival home, but the rain was refreshing. Our 2+ weeks in hot and dry Egypt left us with dry skin, dry eyes, dry hair, dry feet, dry everything. It's good to be home. Traveling is good, but the long flights going and coming are the toughest parts of the trip for us. It was great to touch down at the airport yesterday and to be greeted by wildly waving hands of grandchildren, rain or no rain. Today, our bodies are smack in the middle of jet lag. I know this, because I was wide awake at 3am, ready to get up and refresh myself with my sewing projects. I resisted the urge to get up and stayed in bed until 5:30am. I thought about what meals I would make this week, what crafts I would do with the kids on Wednesday afternoon (only half day of school) and I wondered how much weight I had lost in the 2 weeks we were away. Then my big mistake was thinking about the great cup of coffee I was going to have when I got up. Egypt is not known for their great coffee. That got me out of bed. What a great cup of coffee. It's good to be home. Our next trip south, is in 2 weeks. We're heading south by car, to Nova Scotia, that is. My sister and I have a day or 2 of sewing planned. PS: Despite plentiful buffets for every meal, I lost 2 lbs while in Egypt. Yesterday, we got to visit a Monistary at the foot of Mount Sanai. This is a picture of Mount Sanai which is on the Sanai Peninsula. This of course is the mountain that Moses climbed to get the 10 Commandments. People come here and take a camel ride to the top to see the sun rise over the mountain in the morning. It's sort of a pilgrimage. This is us standing under the Burning Bush that Moses saw. It is in the St. Catherine Monistary which sits at the bottom of Mount Sanai. This is a very holy place, and many many devout people were here praying for one thing or another. 22 Monks live here and visitors are only allowed until noon, then the monks go into their daily prayers. Our trip is coming to an end and the last few days of our trip will be spent here at a posh resort in a community called Sharm el Sheik and it's on the Red Sea. I can't wait to see everyone when we get home later this weekend. We have many stories to tell, as you can imagine. You just can't imagine the heiroglphics we've seen in the last 7 days. There are thousands of inscriptions that have all been studied and interpreted by Egyptologists at least 3 times each. These inscriptions are the basis of many University papers. This is our tour guide, Hesham. He is an Egyptologist and is said to be the best in the country. He is studying for his Masters. He reads this stuff like it was English. Day one in Egypt.Pyramids are awesome. The internet access is limited. We're having fun and already it's a bit of history overload. As we're putting the last minute things in our suitcases ready to board our flights, we have one last look at the weather. We are wondering if we should bring our umbrella's or not. I don't think I've ever seen a 10 day forecast like this before, have you. I expect after 18 days of this, we'll be glad to get home to some variable weather, for a change. Remember the song... "Walk like an Egyptian". My daughter and I used to go to an exercise class years ago, and when that song played, all the class would have to walk like an Egyptian by crouching down and to the side, and angling our hands. Whenever we hear that song, we both laugh and think of those classes. Well, for the past couple of weeks, that song has been in my head. See, later this week, we are packing up and heading to Egypt for a few weeks. We booked this trip so long ago, that I didn't think the time would ever come. It really is a trip of a lifetime. We have been preparing ourselves over the past months by getting immunizations, preparing our weenie tummies for the different food (Activia), and gathering the proper clothing to wear. For women, that means, even though it's 35 degrees every day, bare shoulders in the cities are inappropriate. Part of our tour includes a 4-day cruise down the Nile. On the last evening of the cruise, there is a costume party, and guess what we are requested to dress up as. Right, you guessed it - Egyptians. 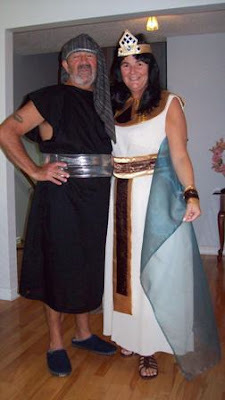 I looked for ideas on the Internet and I had fun going to Fabricville to look for cheap fabric to make these Mark Anthony and Cleopatra costumes. We unveiled the costumes to our families before our Thanksgiving dinner this past Sunday. 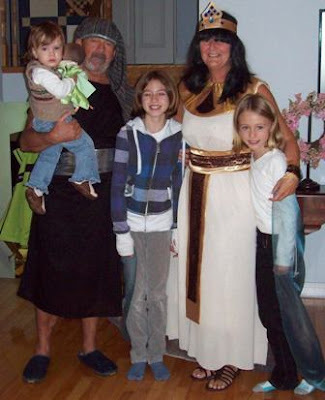 All our kids and grandkids got a big kick out of seeing us all dressed up. It's the first time ever for us that I can remember. Did you ever dress up as adults for Halloween? My new nano is purple. It's a blue/purple and I like the change of color. It is 3 generations newer than my old nano. Itunes makes it so simple to start up a new nano. Hardly any fuss at all. I think there's something wrong though. I've played 12 games of klondike on it, which is the old fashion solitare, and I can't win a single game. I think I'll stick to playing music and listening to audiobooks. I dug out all my old ipod stuff, and put it all for sale on kijiji which is a great place to sell things locally. Within hours, my old nano sold, along with my old ipod video and my charger cradle. All that I have left is my ipod radio. I bet it will be gone in a few days. Maybe I'll go try another game of solitaire! Since we won't be able to be with all our children and their families on Thanksgiving next weekend, we will have our Thanksgiving dinner today. We really do have lots to be thankful for. The top two being, our family and our health. So since we got up this morning, we've been preparing a dinner as we await the arrival of our kids and their kids. The apple and pumpkin pies are in the oven. The stuffing is made and just cooling before it goes in the bird. I didn't have a chance to mention it before, but my friend Linda H. is a troublemaker. Sometimes she does things that send me on a "I want to do it too" kick. Last week she was making decadent chocolate truffles for her son's wedding which is next weekend. I went over and helped her roll the truffles in cocoa. I went home and just had to make a batch. They are so delicious. But you can imagine what the problem is. I'm eating them every day. So I made up nice little containers done up with truffles in them for my girls. They can each take some home to enjoy . Want Linda's recipe, click here. She posts about what chocolate she uses here. Our world seems to be filled with construction and home maintenance projects. Actually it's quite exciting to get some long overdue work done. Our back deck has been unusable for a few years now. The frost lifted one of the concrete support a few years ago, and it never did settle down. So last winter we put our name on a list with a concrete company to come and dig up our entire back deck and make the repair to the deck foundations. So last week, the concrete work was done on 4 posts and it's so nice to see that the deck has settled down again and is flat. My sister gave me a children's book last year called "If you give a mouse a cookie", and our construction projects seem to go just like that book. The new concrete posts lead to replacing the rotting deck floor, which leads to replacing the old weathered steps. So while we're replacing steps, why not make a new lower deck for the new steps to go down to. The carpenters are here today doing the work. I can't wait to see how nice our lower deck is going to be. I hope there is significant work done by tomorrow that I can show you a picture. Well, anyone who knows me, knows I love my nano. I mainly use it to listen to music while I'm walking or exercising at the gym. 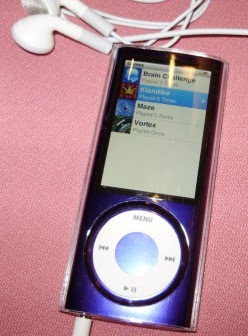 But I do also use it to listen to podcasts and audiobooks and I also store current photos on it. My few outlook contacts are sync'd on my nano. I have the ipod radio accessory, and I have the Nike sport kit that acts as a fancy pedometer. But I can't use them at the same time because they plug into the same jack. So I think the time has come to splurge on the new Gen 5 Nano. I has a built in radio which is the number one reason I have decided to purchase the new generation. That way I can use my sport kit and listen to the radio at the same time. This new nano also has the capability to take and view video. I have some favorite videos of the kids that I enjoy looking at from time to time, so I'll be able to load them on and look at them from time to time. So now I need to decide on what color to choose? I've had my green nano for 3 years, so what color do I want to live with for the next three or more years. I'm thinking purple, or maybe pink, or maybe orange, or how about gold! I think these nano's are just starting to ship from Apple now, so I'll show you my color decision after I get it.